A total of 6 matches were played today of the ongoing FIFA world cup 2018 friendly matches. The match wise highlights of all 6 matches are appended below. Both Switzerland and Spain were on a winning streak as both teams looked in tantalizing form before the World Cup. This was the first of the two games that Spain would play before the FIFA World Cup 2018 in Russia. The match started as the Spaniards seemed to dominate the possession from the very start. This allowed them to score an early goal as Odrizola took his chances and netted the ball at the 29th minute to make it 1 – 0. Swiss, who were pretty much defensive in their approach held Spain back for a while as the 1st half came to an end without any goals from each side. The 2nd half started and the score was now 1 – 0 with Spain leading from the front. Swiss were doing their best to attack but Spain’s defenders including Pique were quite brilliant with their tackles. And, this was putting Swiss forwards constantly on the back foot. 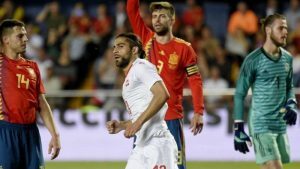 However, mistakes do happen and this was a prime example of such a mistake as Ricardo Rodriguez capitalised on Spain’s keeper David de Gea’s mistake and scored the equaliser. The goal was scored at the 62nd minute so Spain still had time to score the match winning goal. But, that did not happen as Swiss suddenly began blocking Spain’s attacks. And, the end result of this match was a draw. Spain would be disappointed however, it was a good experience for them before the FIFA World Cup 2018 in Russia. When both teams are not letting the ball go, the match becomes much more interesting. This was the story of today’s match of Serbia Vs Chile. As both countries looked pretty determined to win this friendly and accelerate their preparations for the upcoming FIFA World Cup 2018. This is the reason as to why we witnessed a tight first half as no team allowed the other to score a goal. After the 1st half ended several substitutions were made as both teams looked to score the tie-breaking goal. And, it was Chile who attained this objective as Guillermo Maripan scored at the 88th minute and put Chile in the front. Serbia had little time to match the scoreboard by scoring a goal, however Chile denied them the opportunity and won the match. No goals were scored by any team in the 1st half as it came to end with the total score being 0 – 0. 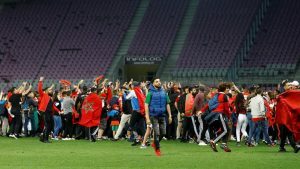 But, Morocco’s dominating possession and more shots than their opponent allowed to score 2 goals in the 2nd half of the match. Meanwhile, Slovakia could only manage one goal as the match came to an end with Morocco winning the match by 2 – 1. A goal-less 1st half was followed by an opening goal of the match in the 2nd half as Zaza put Italy in the lead. This was followed by a red card that was given to Cristico and Italy now had to win this match by a team consisting of 10 men. However, the Dutch took advantage of this weakness as Ake scored a goal at the 88th minute to equalise the scoreboards. The score remained 1 – 1 till the end of the match as no team could score a tie-breaking goal.